The Big Fountain is a monumental fountain built in 1610-1612 on the Janiculum Hill to mark the end of the Acqua Paola, which had been extended by Pope Paul V to create a clean source of drinking water for the people on the Janiculum Hill. The aqueduct had been originally created in 109 AD by Trajan. Funds were raised from taxes on wine to build the fountain, which caused some residents to complain. It was inspired by the Moses Fountain, and this fountain, in turn, inspired the Trevi Fountain. This fountain was designed by Fiovani Fontana, whose brother had designed the Moses Fountain. White marble from the ruins of the Temple of Minerva in the Forum of Nerva was used, and granite columns from the ancient St. Peter's Basilica built by Constantine were also scavenged. 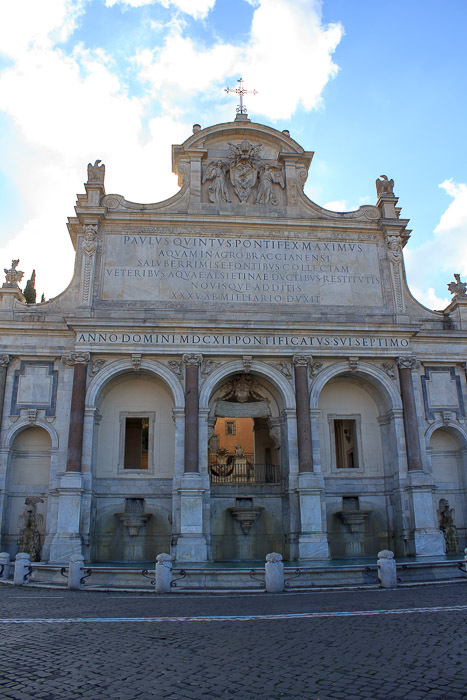 The inscription praises Pope Paul for bringing water to the hill, and at the top of the fountain is the papal tiara and keys above the Borghese family coat of arms of an eagle and a dragon, supported by angels. On top of the three central arches are openings that provide a glimpse into the botanical garden beyond. 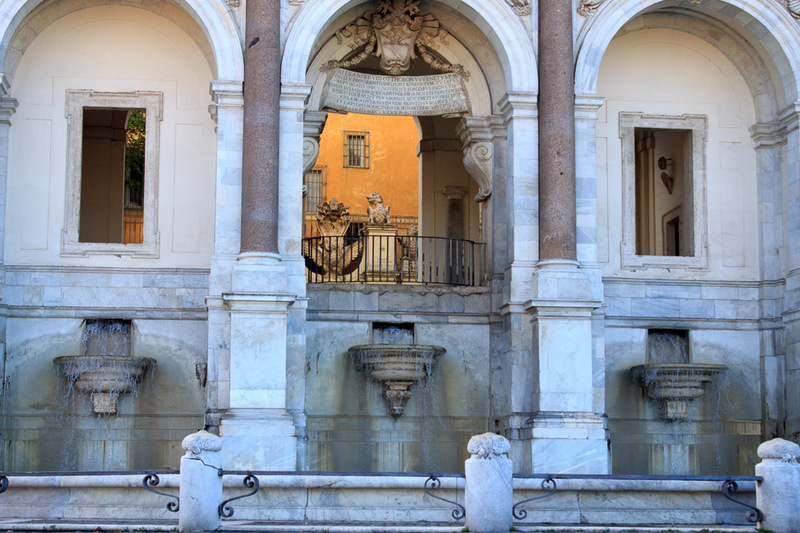 The theme of this fountain is simply water: five streams pour through the five arches into five marble basins, and they overflow into a large semicircular pool at the bottom. The fountain looks quite nice nowadays since it was restored in 2002-2004. It was featured prominently at the beginning of the movie 'The Great Beauty'. If you turn your back on the fountain, you get a spectacular view of Rome, but just wait -- the view is even better from the very top of the Janiculum Hill, at the monument to Giuseppe Girabaldi which is a short walk uphill from here. See all Big Fountain photos.